Those core rules have to stay just as they are. If ever you've wondered why each Call of Duty is much like the rest, you can thank tournament play, says Infinity Ward's Mark Rubin. E Sports are a big thing for the franchise, and if Call of Duty is to retain its edge it can't afford to change its core rules. Pro gamers need consistency, and that's what Infinity Ward provides. Luckily those core rules aren't too difficult to remember. "You're a player, it's in first-person, you have a weapon in your hand and you run around shooting other people," says Rubin. There are things Infinity Ward can fiddle with, like the maps, and character customization, and Infinity always wants to make a better game than it did last time. What it can't afford to do is make a game that's significantly different from the one it made last time. So Infinity can have something like the new Ghosts game mode Cranked, which emphasises kills by speeding up your avatar every time you make a kill, and also punishes you with explosions if you fail to chain kills every thirty seconds or so. But what it can't do is take away the kills, or the guns, or the shooting of the guns to get kills. Yes to new game modes, yes to new game content, no to new game play. 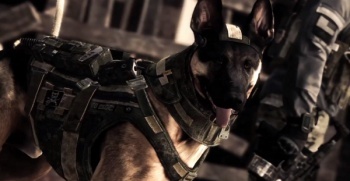 Call of Duty: Ghosts is due for PC, PS4, PS3, Xbox One, Xbox 360, and Wii U November 2013.